• Maritime Patrol Systems 2030: Signature of a Letter of Intent. 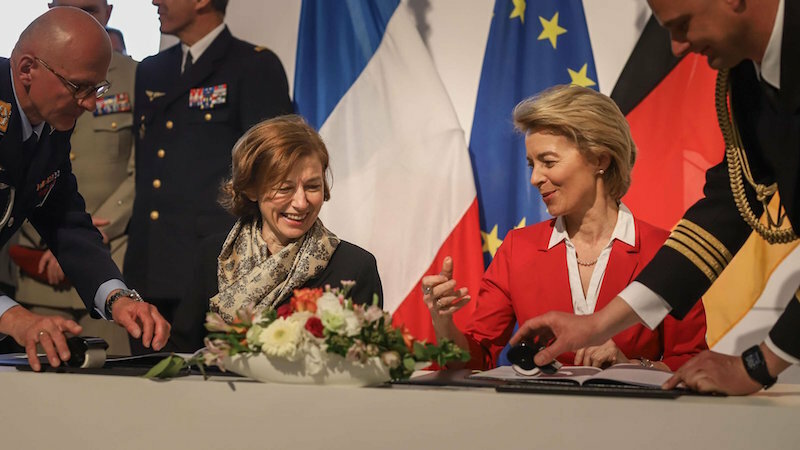 The Minister of the Armed Forces, Florence Parly, visited the show on April 26 with her German counterpart Ursula von der Leyen to mark the importance of these advances, which are the fruit of intense work by the two ministers. These projects symbolize Europe’s investments in its industry, an industry that innovates in key sectors and that is working for Europe’s strategic autonomy. France and Germany have agreed, during the Franco-German Defense Council in July 2017, to work together on an air combat system to jointly develop the replacement of their current fleet of combat aircraft. Less than a year after this decision, the many exchanges led by the Minister of Armed Forces, Florence Parly, and her German counterpart, Ursula von der Leyen, helped define the basis of the project. On 26 April, the French Air Force’s Chief of Staff, General André Lanata, and General Bühler, the German Air Force’s Director-General for Planning, signed a "High Level Common Requirement Document." (HL CORD). The strong political will of the two ministers to implement this historic project, and the dialogue between industrialists that is made possible by this agreement, consolidates the project. 1.1 What is the Franco-German Future Air Combat System project? • The future air combat system aims to succeed the current fleet of combat aircraft (Rafale - Mirage 2000 / Tornado - Eurofighter). It will revolve around a piloted component, missiles, highly-connected drones able to act either autonomously or within a system of systems, in order to face the challenges of future operational environments. 1.2 What are the main operational requirements expressed in HL CORD? • As of today, a Franco-German common vision of the operational need related to the replacement of the Rafale (Fr) and the Eurofighter (All) by 2040, a necessary step before any variation of the industrial aspect. • Taking into account the challenges of the operational environments of the future. • The need to replace the Rafale and Eurofighter fleets. The system will therefore have to be versatile and flexible to use. It will have to be able to act autonomously, or within a system of systems, in order to face the challenges of future operating environments. • SCAF will have to meet the requirements of all air-to-air missions. • The survivability of SCAF will enable it to cope with all future threats. • The future air system must be interoperable with NATO and EU assets in a framework of offensive and defensive operations. • SCAF will need air superiority capabilities in the face of future air threats. • SCAF must be able to engage all targets of interest for air surface operations. • The SCAF must be able to act in a disputed air environment and engage all types of air defense systems. • Increased need for connectivity and real-time data merge capability. • The SCAF (French particularity) must be able to be navalised. 1.3 How can we reconcile the Future Air Combat System (SCAF) with the Germans and the Future Air Combat System (FCAS) with the British? • Discussions between the German and French teams on SCAF are intense. • In addition, there is work between France and the United Kingdom on the FCAS project of combat drone technology demonstrator. This project is evolving since the Franco-British summit of January 19th. • Today the priority is to ensure that the Franco-German base is solid before starting to open up to other partners. • In parallel, we will continue Franco-British work that is complementary to the Franco-German approach and we will see, when they have reached a sufficient maturity, the terms of integration into the SCAF project. All this will have to be negotiated with our partners. 1.4 With the SCAF program, would there not be a transfer of French technologies to Germany? • Depending on the country, there are more or less strong skills, technological and industrial know-how. • Our goal is that collectively we all move upmarket. But the idea is to build a program by capitalizing on existing skills. The model of the EURODRONE MALE was unveiled at the ILA show. The design work jointly launched in September 2016 within the framework of the Joint Armament Cooperation Organization (OCCAR) must lead to a production contract for deliveries from 2025. This program includes Germany, Spain, France and Italy, with Belgium having observer status. It is intended to welcome other European partners. For France, this component will replace the Reaper UAV system currently acquired from the United States. France will acquire six EURODRONE systems, each composed of three aircraft vectors and two ground stations. 2.1 What is the fundamental issue of the program? • The aim is to have a European Sovereign Intelligence UAV capability, which is essential for our decision-making ability and superiority in operation, by equipping the mission-chain systems designed and produced in Europe without any constraint. from third countries. • It is fundamental that the development of the critical chains of this system (communication, sensors, effectors, cyber security) be entrusted to the European industry, to be free from any constraint or restriction of use. 2.2 Will the European MALE drone be armed? • Drones will have the ability to fire weapons. 2.3 What are the next steps of the program? • On the basis of the results of the definition study, the next step is the preparation of a request for proposal for the implementation phase integrating the development, production and initial support activities with a notification target in 2019. 2.4 What is the industrial organization and the place of French industry? • The 4 manufacturers (Airbus Germany, Dassault, Leonardo, Airbus Spain) are in the process of establishing an industrial structure with a division of roles under discussion. • An opening of the project to other industrial skills is planned during the implementation phase. The modalities remain to be defined. • In the current consortium, French industry is represented by Dassault Aviation. In the next stage of implementation, other French manufacturers are well-placed to join the industrial organization in areas with high added value (connectivity, sensors ...). 2.5 Distribution of funding among the four nations for the definition study? Will this distribution be the same for the development market? Is the principle of industrial return enforced? • For the current definition study, the financial contributions are 31% for Germany, and 23% for Spain, Italy and France. • For the moment, the distribution of funding has not been defined for development, production and support. • There is no industrial return requested on the program. The OCCAR rule for a global return on all programs conducted by the OCCAR applies. The main missions of the maritime patrol are the underwater fight and the anti-ship fight. At present, the capability is based on long-range aircraft with a combat system based on a suite of sensors (radar, electronic warfare, optronic sensors, magnetic anomaly detectors, buoys), weapons (torpedoes, anti-ship missiles ...) and tactical communications / data links. The French capability is based on 18 Atlantic 2 aircraft (Dassault Aviation) now being upgraded. Since 2006, the German maritime patrol force has been based on eight P3 Orion aircraft (Lockheed Martin) manufactured in the 1980s. The meetings held at the "working level" showed a similarity of the operational needs, the calendars, and the general philosophy. 3.1 What is the purpose of the Maritime Airborne Warfare System - MAWS Letter of Intent? • France and Germany must both replace their maritime patrol systems by 2030. • The letter of intent materializes and confirms the willingness of both ministries to engage in this cooperation. • The objective is to study the conditions for the development of a European solution to have an autonomous and efficient maritime patrol capability in Europe. 3.2 What are the next steps? • The signing of the Letter of Intent will allow us to prepare a technical arrangement covering the design phase by mid-2019. • We now need to jointly conduct the system architecture analyses. • It will be articulated not only around a new inhabited platform (successor for France of the ATL2), but also capacities offered by other systems such as the European MALE drone. 3.3 Has an industrial organization been decided? • The choice of an industrial architecture will be made only after the completion of system architecture studies. • It will be based on the skills of the major European contractors. • Competence will be as in the other programs our common thread in these choices. 3.4 Is the project open to other partners? • Our cooperation logic aims to open our programs to other partners. • However, it is important to consolidate a Franco-German approach, facilitating the subsequent analysis steps, as we propose for other projects. • In this context, we study in a concerted manner what could be an observer status in such projects to facilitate subsequent integrations.